Valentina Ferrandes is an Italian artist currently living and working in Berlin. She works with photography, video and new media. Her projects investigate documentary and fictional representation of landscapes and architecture. Valentina Ferrandes - THE OYSTER EFFECT, HD Video - 2010 - 12'51"
Valentina Ferrandes - BERG, HD Video - 2011 - 11'53"
BERG, HD Video - 2011 - 11'53"
Teufelsberg is a man-made hill in the outskirts of Berlin. It was built by the American Allies with the rubble of the city destroyed by World War 2, in the 20 years that followed its end. Created out of debris on Grunewald’s plateau, Teufelsberg became the highest viewing point in Berlin and a favorable location for military observation of the city. Prior to establishing the first permanent buildings on site in the very late 1950s, American Mobile Allied listening units used to drive to various other locales throughout West Berlin hoping to gain the best vantage point for listening to Soviet, East German, and other Warsaw Pact nations military traffic. Due to the evident vantage point it could offer, a permanent listening station was then built on Teufelsberg, to be run by the National Security Agency until the fall of the Berlin wall. With the end of the Cold War, the listening station became redundant, it was closed down and its equipment removed. It remained a disused structure for over 10 years, to which followed ten more years of negotiations between various property developers interested in purchasing the land around it, the possibility to create a spy museum, and the final decision to classify the hill as forest in the land use plan of Berlin, halting any possible attempts to build. Whilst the site remains private property, since 2004, local visitors as well as tourists regularly access it. The traces of its history are still visible on the building, and as in many other places in the city, this aspect makes the location spookily attractive. In the last few years, Berlin has seen a progressive “fetishization” of its dramatic past, of the images and sites linked to its most dramatic memories. Tourists flock to the German capital to grasp a fragment of the city’s historical ambiguity. City tours through museums and public urban sites enable the consumption of images, sounds and text, solely to fulfill a temporary hunger for a superficial understanding of the city’s debated development. Phases of history, collective memory and personal biographies are fragmented, summarized and re-arranged into visual captioned maps for rapid absorption. Teufelsberg lies still on the edges of many tourist destination maps. But as more and more artists, musicians and bloggers visit the site and publish their materials, this ghostly, set-like architectural structure keeps feeding the public’s cinematic imagination. 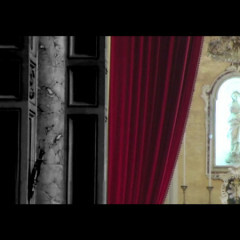 The video BERG, investigates a historical site through an alternate shift between documentary and fictional representation. A soundscape produced from samples from a number of mainstream Spy Movies overlaps a carefully edited selection of classic shots, inspired by the most repetitive cinematic clichés to be found in the espionage genre. If visuals and sound maintain a linear continuity in certain sections of the film, as the video unfolds, it becomes clearer that the voiceover belongs to a less recognizable past – more or less fictional - whilst the location, Teufelsberg, is depicted in its contemporary condition. THE OYSTER EFFECT, HD Video - 2010 - 12'51"
Using as a starting point parts of archive footage shot by De Martino's team during his first research in Salento, a rural area of South Italy, The Oyster Effect develops into a collage of historical references as narrating voices over a visual journey. In the film, the portrayal of women and hysteria is shown as a series of parallels between built environments, architectural spaces, landscape and their narration. The viewer travels through foreign languages and non-descriptive locations, in a journey that challenges linearity and historicism .